On any given day our inboxes are likely to be flooded with emails. For one prospective student in the US, this was particularly true. The Reddit user Popopopper123 received a staggering 2,374 emails from 115 universities during the application year and decided to analyze and publish the findings. The results certainly make interesting reading. The average number of emails sent per university was 18.9, but some institutions went well beyond this figure. Louisiana State University sent the most emails, 102 in total, and 9 institutions sent over 40 emails. 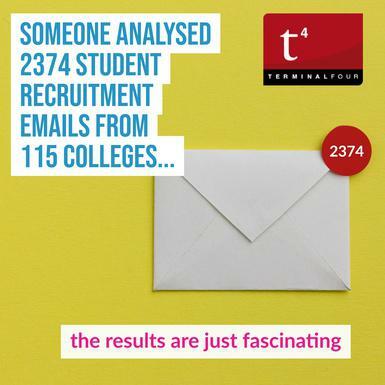 The institutions the prospective student had applied to sent an average of 9.7 emails. 15 institutions sent custom application offers via an average of 31.5 emails. 12 universities sent application deadline extension offers. Clearly, 102 emails is an excessive attempt to connect with prospective students but what is the optimum level of engagement? Perhaps there isn't an optimum number of emails institutions should send to prospects and it's less about the quantity and more about the quality of content which goes out. At certain times of the year, it could be worthwhile sending some email campaigns in close succession while at other times of the year this could overburden recipients. As long as the content is high quality, relevant, informative and timely, most prospective students will be happy to receive it. Universities could focus on campaign management, building out their content schedules for the upcoming year based on key events. Another approach would be to develop engagement strategies which deliver emails to prospects based on their first and subsequent interactions with the institution. What's in a subject line? Popopopper123 also analyzed subject lines. Nine institutions sent emails with subject lines like "Is this you?" or "Am I reaching [name]" or "Is this your email address?" Of the universities that sent custom applications and deadline extensions, many had sent emails with very similar subject lines. It turns out these universities are clients of the same marketing company in the US and the content overlap both in subject titles, and body content was extensive. Does it matter if institutions use similar subject lines? Perhaps. The key is authenticity, and if there is an overlap, there could be a risk that they will be seen by the same prospective student. And in such a competitive market having unique content is crucial in order to stand out. Some of the emails sent out by institutions seemed to attempt to fabricate a personal connection. For example, some institutions used a plain text format, which made it appear as though it was sent personally from the Dean of Admissions. Another approach taken by an institution was to add ‘Sent from my iPhone' perhaps to make it appear more like a personal approach. Students know there are a large number of people involved in marketing universities, and that they reach out to thousands of prospects each year. Fabricating a personal connection, therefore, doesn't work. Instead, institutions should focus on timely and useful information, delivering authentic content which is relevant to the prospect, highlighting the unique attributes of the university and using personalization touches to bring communications to life. One of the additional observations made by Popopopper123 was the mismatch between email content and institution's websites. In one example an institution has a website which focuses on significant research and discoveries. In contrast, the Reddit user described its email content as sounding desperate for applications. Instead, universities need integrated marketing and content strategies to ensure the voice of the institution is consistent. Moreover, of course, email content should demonstrate confidence, by focusing on the attributes prospective students will want to be associated with. Email remains one of the most effective channels. The past twelve months has rattled the world of email marketing, firstly with the Cambridge Analytica scandal and then in Europe with the arrival of the General Data Protection Regulation (GDPR) which gave more power to consumers. 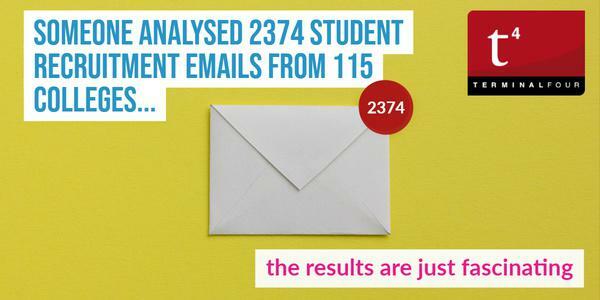 Despite this, email remains a highly effective channel for universities when used intelligently, and it's certainly here to stay. What do you view as the optimum number of emails to send to a prospective student who has interacted with your university? Also, do you have an email marketing strategy based on interactions?